The Huacaya Alpaca Weather Vane, Vicugna pacos, was one of our first designs. West Coast Weather Vanes offers two types of Alpaca Weather Vanes: Huacaya and Suri. To replicate the Huacaya signature coat we created custom hammers for laying in this unique texture. Over the years we have designed many custom hammers for specific texture needs, such as mermaid scales, bird feathers and grizzly bear fur. Animal weather vanes with heavy and dense texture are technically more difficult to craft than smoother sculpture pieces. This is because the texturing process displaces the copper, making it more of a challenge to shape and solder. It takes years of experience to anticipate and master the effects of how this hammering technique, known as repoussé, will stretch, move, bend, and thin the metal. Texturing and shaping is the essence of this exacting craft and art form. 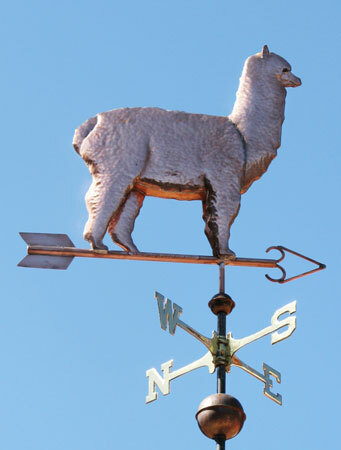 The earliest version of our Alpaca Weathervane was based on the Huacaya and was our standard for many years. It wasn’t until a decade later we added the second variation, showcased here. The original was made in a style called mirror-image, meaning the pattern pieces are the same on both sides of the weathervane. The hindquarters on the version pictured above are different on each side of the sculpture piece, creating a slightly more complex and interesting silhouette when seen against the sky.